Sight words are important in the process of children’s learning . Words need to be read and written so I try to make these worksheets to practice sight words in the class or at home. 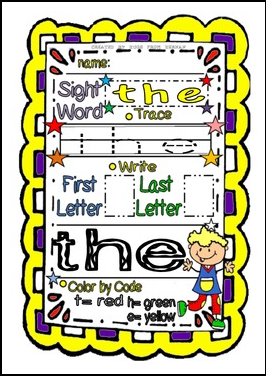 You are able to choose a sight word of the day and deliver the printable sheets for every class or you can deliver different sheets so that students can have different sight word sheets. For the last alternative, I decided to make a single record sheet so that you can record the students with their corresponding sight word sheets(only for big sets). 4 simple tasks are involved in every sight word sheet. First of all, after writing names, students have to read the sight word. At the second activity, they have to handwrite the word.Then, the kids have to write the first and the last letter of it and finally, they have to color the word by codes. These sheets come in both black and white and colored versions. Sight words fun is an effective way of teaching Language in the class and a great motivational resource for the children to have fun and learn new words. please, leave feedback if you think this is a great resource for the class! I'm planning to make different sets for kinder, second and third grade too.